Fourth of July Desserts was posted on July 4th, 2012 and is filed under Desserts. This entry has 14 comments. You can follow any responses through the RSS 2.0 Comment Feed. Happy Fourth of July! Although I’m a die-hard Canadian, I wanted to create some fun recipes for my American friends. For those of you who are doing the Smoothie Challenge, you might want to try this for a healthy dessert. 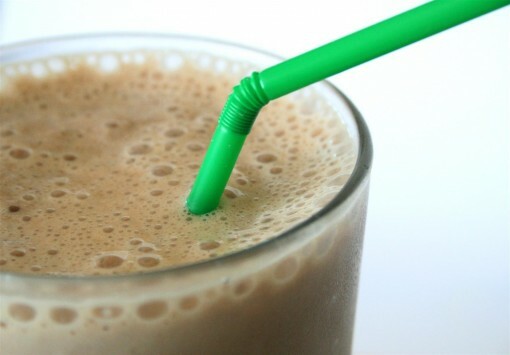 Make a coconut or banana based smoothie and divide it by three. Set aside a third of the smoothie. Blend one third with strawberries and the other third with blueberries. Then, carefully layer all three flavours together. And yes, the blueberry layer may turn out more purple than blue. Whatever. It’s pretty. On the flip side, here’s something not-so-healthy for tonight’s dessert – it’s a holiday, so you can afford to have something slightly sinful like this dessert pizza. Make your favourite sugar cookie recipe and bake it on a pizza pan. From there add equal amounts of whipped cream and cream cheese together and spread it over the “pizza crust” once it’s cooled. Then add blueberries and sliced strawberries in circular patterns for a festive and beautiful look. If you choose, you can also add a glaze on it like I did. Either way, it’s delicious. I brought it to one of our volleyball tournaments and people really seemed to like it. So I’m still sick (sad face), but it didn’t stop me from working out yesterday. I still drank my GenetixHD ProSculpt and went for a 45 min incline walk (6%) with 3lb weights at 4mph. It was an easy workout, but I still got a bit of a calorie burn without making myself feel sicker. Now, if I can work out with a cold/cough, you can get your workout in too! I’m hoping to fit a light workout in this afternoon too…probably more of the same. I actually had two smoothies yesterday. In the morning I had this amazing smoothie…oh my. It was so good. Don’t worry, I’ll share the recipe soon. I just wanted to tease you first. After my treadmill walk yesterday I had my Vega Energizing Vanilla Smoothie (review coming soon!) and it was just what I needed after exercising. I really love their protein – I don’t know how they do it, but somehow they get servings of vegetables in their drink mixes and I can’t tell. They’re just brilliant people (based out of Vancouver, I might add!). Hope you all have an AMAZING Fourth of July! I am so thankful to have so many amazing American readers – thanks for being so awesome! Do you have any big plans for today? What’s your favourite Fourth of July dessert? Thanks for doing Fourth of July recipes, too. I was already planning on making a layered smoothie today for the occasion. Now I know that’s what I’m meant to do. Can’t ’til smoothie time. Yum! I love your fruit pizza idea too. I really need to give this a try, maybe with a raw crust made of nuts and dates. Yum! OH yes, love that fruit pizza. and guess what i just restocked? VEGA! love the vanilla almond. LOVE sugar cookies with fruit. Yum. But that smoothie looks delish. Share! That dessert pizza looks to DIE for, wow. So gorgeous! I have only just bought a new blender (since mine unfortunately broke) and have been making smoothies quite often. This one looks great! My mouth is salivating…damn that looks good! I am loving summer smoothies…try something different every time! Just discovered coconut almond milk which adds a great nutty flavor! Mmm, I made a similar fruit “pizza” once- it was soo good! And I love your colorful smoothie idea! Um, yum! That pizza looks amazing! I’m not usually a fan of dessert pizzas – I usually find them too rich, but I’ve only ever tried chocolate ones. Fruit might be the way to go! I feel like EVERYONE made a variation of a fruit pizza or cake this year – I’ve never seen so many in person or on the blog! This year on the 4th though I had some red velvet cake and my mom’s FAMOUS healthy banana pudding. It’s amazing! She just uses reduced fat vanilla wafers, fat free cool whip, bananas, and fat free/sugar free banana pudding. Yeah, prob full of many an artificial ingredient, but damn it’s good. I love that dessert recipe!